I don't know what the best solution might be for the current crisis in Syria. Not every problem has a solution, and maybe this is one of those. Certainly, none of the likely outcomes to any foreseeable scenario seems to promise anything like a good solution! Such is often the state of things. Unfortunately, that is a discouraging fact that people often tend to ignore, especially when feeling self-righteous, a sentiment Syria's latest atrocity (as indeed it deserves to be called)has evoked among our chattering elites. Unlike, for example, Mubarak's regime in Egypt, which was a trustworthy ally that kept peace with Israel and ensured some modicum of stability in the region, the Syrian regime seems to have no redeeming social value. Except, of course, that the Islamist alternative might be even worse for stability in the region (and for the survival of Syria's Christian minority). That means intervention against Assad - intervention to remove Assad - might well produce something even worse. At best, it would likely lead to a continued civil war as opposing factions fight each other brutally for the spoils. It's hard to see how those who claim to be motivated mainly by humanitarian considerations can see any satisfactory solution in that. Of course, the US could, if it wanted to, do another Iraq and go in all the way. Assad would almost certainly go the way of Saddam Hussein. But the likely outcome would still be another civil war and more terrorism. The fact that such an intervention is unlikely to produce a sufficiently better outcome to justify it, combined with the real fear of Russian intervention on behalf of its ally, combined with American war-weariness after 12 years of wars in Afghanistan and Iraq - all that more or less guarantees that such a full-scale intervention is off-the-table. That leaves the more limited options of air attacks not intended to destroy the regime, just to "punish" it for its sin of using chemical weapons. At best, that might result in Assad's not using them again - which is something, but not much of a consolation to the thousands of Syrians he has already slaughtered (and the many more he will probably slaughter in the future) by ordinary means. Of course, such a limited attack merely to "punish" Assad might weaken him sufficiently to give his enemies an edge, thus eventually ensuring either an endless civil war or an Islamist victory. It could also scare (or anger) Assad into spreading the war to Israel. And it could scare (or anger) the Russians to intervene in some fashion. Really the only argument for such a limited intervention to "punish" Assad would be to maintain (or restore) US credibility - the US having brought this situation on itself with its earlier threat to react if Assad crossed that now infamous "red line." That is a legitimate argument. What further mischief might Iran or North Korea engage in if US threats are shown to be empty? Perhaps the real lesson here is not to make such unwise threats in the first place. The use of such adolescent metaphors as crossing lines and red lines does little to advance our national interest, does little to further our national security and that of our allies, does little even to help us sort out our priorities beyond a culture of indignation against one particular style of slaughter. Of Saint Monica's famous son Saint Augustine (354-430), whom a grateful Church commemorates today, Henri Marrou once suggested that he is one of the few Christian thinkers whom non-Christians still seem to take seriously. Historically, of course, the specific circumstances of Augustine's time, among them the collapse of classical conceptions of social order and the cosmic catastrophe suggested by the fate of the city of Rome, all created an immediate need and set the stage for Augustine's influential work. Still, something more was involved than was simply situational. If indeed Christian faith attaches certain specific requirements to one's thinking and action and imposes in the process a new form on the matter of social life, then Augustine was preeminently suited personally for his historical task. As his Confessions, for example, demonstrate, Augustine sampled most, if not all, of the available intellectual and spiritual options of his time. Having left them behind, he experienced in his own life the full force of Christian faith's distinctive demands. His Confessions clearly illustrate the transformational character of his personal experience. In the aftermath of his baptism in 387, Augustine adopted a style of life recognizable to his contemporaries as philosophical. But already there were differences, signaling a subtle move from his previous neoplatonism. The participation of Monica in his and his companions' philosophical life (illustrated, for example, in Augustine's earliest Christian writings) immediately signified something new. Max Weber (The Sociology of Religion) once observed that no religion ever resulted from intellectuals' chatter. Saint Monica's role in Augustine's transformation substituted for what was religiously defective amidst the admitted attractions of philosophy. She represented the alternative to be found in the authentic piety of the faith community. Augustine, after all, was the product of a "mixed marriage." That "mixed marriage" represented the two different directions actually available to Augustine - the old Roman civic tradition, that represented the best of the past and was coming to an end, and the new tradition of Christian faith, that represented hope in the future. In Augustine's personal experience, his father personified the one and Monica the other. Monica, moreover, didn't just represent residual impressions from Augustine's childhood religious experience. She served as a bridge connecting those impressions and that childhood experience with his active adult re-immersion in the public life of his time in the context of his increasing involvement in the communal life of the Church. Hence the symbolic appropriateness of Monica's conclusion of her role in Augustine's early dialogue De beata vita (IV, 35) by her invocation of Saint Ambrose, who, perhaps more than anyone else in Augustine's experience, personally modeled Christian faith's transformative effect on classical romanitas. Forty years ago, one of my grad school classmates was taking his General Examination. It happened to be May 4, the feast (as I then thought it still was) of St. Monica, famous example of persevering prayer. So I promised to pray for my friend's perseverance. I didn't realize, of course, that the new Roman Calendar had (for no obvious reason) bumped Monica from her traditional date in May to August 27. (My friend passed his exam anyway). 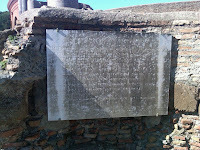 The attached photo shows the commemorative stone marker at the site of Saint Monica's death in the Roman port city of Ostia (now the archeological site Ostia Antica). Monica died happy - happy that she had lived to see her son Augustine baptized at Easter 387. We know that - as we know everything else that we know about her -from her son's account in his Confessions. Augustine's father Patricius had also been devoted to his son and done much to further the education that would make possible a brilliant career. But Patricius was a pagan, and Augustine very deliberately made a point in his Confessions of highlighting Monica's role rather than his father's. The relationship between Monica and Augustine illustrates the importance in life of background - what social scientist might call primary socialization. Having sampled everything late Roman antiquity had to offer in terms of intellectual and spiritual options, Augustine in the end returned to the faith of his childhood, to what he had learned from and been introduced to by his mother. We do develop intellectually and spiritually as well as physically. We grow and change and keep growing and changing throughout our lives. Yet what we learned and experienced as children - in the family and in our early social surroundings - that sticks with us is acknowledged and unacknowledged ways. How we are formed in the home may have more to do with who and what and how we turn out to be than almost anything else that happens later. Augustine's effusive tribute to his mother highlights how important background is and how essential it is for a society (and for the Church community) to nurture that. At midnight I rise to praise you, or, as our ancestors would have prayed it, Media nocte surgebam ad confitendum tibi - Psalm 119 : 62. The ancient custom (which Carthusians still observe) of rising in the middle of the night to recite (or chant) the office of Matins or Vigils (the ancestor of our current comparatively brief Office of Readings) may not have been as physically challenging as I always assumed it to be. A recent post on Slumberwise "Your Ancestors Didn't Seep Like You" http://slumberwise.com/science/your-ancestors-didnt-sleep-like-you/ paints a picture of pre-modern sleeping patterns in which rising for the Night Office would have been just one of many options for people who were accustomed to sleeping in two shifts. Instead of our contemporary ideal of 7-8 hours of continuous uninterrupted sleep, their sleep would have been spread out over two shifts during an approximately 12 hour period - a few hours of sleep, then a couple of hours of wakefulness, then another final few hours of sleep. It made sense, of course, especially in winter when the nights were long and dark, for people to go to bed early. I always understood that, but always wondered how ordinary people (not monks and canons, who had the Office to recite) managed to sleep the whole night straight through. The answer apparently is that they didn't. Furthermore, unlike for us moderns for whom interrupted sleep is a burden, it seems that in that pre-electric age waking up in the middle of the night was normal not problematic. As the author suggests: "The middle hours of the night, between two sleeps, was characterized by unusual calmness, likened to meditation. This was not the middle-of-the-night toss-and-turn that many of us experienced. The individuals did not stress about falling back asleep, but used the time to relax." I'm generally sleeping better than I used to. I still sometimes wake up during the night but more often than not manage to get back to sleep. I still worry I am not getting a sufficient amount of continuous uninterrupted sleep, but what this tells me is that maybe I really shouldn't be so worried. My only regret remains that most of my middle of the night waking time still tends to be wasted. For every time I get up and read, for example, there are many other occasions when i just toss and turn until I fall back to sleep. If only I used that time, as generations of Religious before me did, to pray the Office! I've been meditating on the Gospel [John 1:45-51] for yesterday's feast of Saint Batholomew (Nathaniel) - in relation to the 32nd anniversary yesterday of my reception into the novitiate. At the moment, at least, I can hardly think of a better choice of Gospel for anyone's entry into Religious Life. Philip finds Nathaniel and tells him about Jesus. Nathaniel is skeptical - especially given Jesus' rural Galilean origins. Eventually, he meets Jesus, who impresses him by his (presumably supernatural) prior knowledge of Nathaniel, who then jumps from extreme skepticism to ostentatious belief. But the link between the two scenes - what makes the story so special - is Philip's initial response to Nathaniel's skepticism: "Come and see." Most of us never experience anything like Nathaniel's personal encounter with Jesus. For most of us, the Christian life is a long, often uneven process of coming and seeing. Certainly religious life is a lot less like Nathaniel's instant transformation into a committed disciple than most of us, the day of our reception into the novitiate, might have imagined. As with Nathaniel's coming to Jesus, coming to the novitiate was a step. But the seeing part was a lot less quick and clear and complete. In fact, so limited and partial and clouded and at times even contradictory can be one's experience of seeing that the whole process requires multiple and repeated re-commitments to the journey - recommitments to coming so as someday to see fully and completely, widely and deeply. The ultimate fruit of the process of coming and seeing that is religious life - that is any authentic disciple's vocation - is in eternity what Nathaniel saw. For now, however, the true test and fruit of our coming and seeing is that, as a result, one takes on Philip's role and becomes and apostle calling others to come and see, leading others to come and showing them what to see. "Once again I am aware of the mystery of my vocation." Thomas Merton wrote that on February 22, 1953, on the 11th anniversary of his reception of the habit. I suppose many, many Religious priests, brothers, and sisters have thought thoughts similar to his - especially on such occasions. I too think such thoughts on such a day as this - 32 years into my Paulist journey that began, blandly but hopefully, at Oak Ridge, NJ, on Monday, August 24, 1981. I had to open the Church very early today 7:00 a.m. to let in the workmen who are hopefully finally nearing the end of the ceiling work in the Church. So I had plenty of quiet time by myself in the early morning darkness and stillness between then and the 8:30 morning Mass - time enough not to let this modest anniversary pass too modestly! I remember the eight of us - shivering in the cold in chapel , carpooling to wherever, being lectured to by so many guest speakers, being told novices should not have opinions, etc. We were an interesting group. I contributed my fair share to our group dysfunction. So I do not blame anyone for the troubled times. They were just part of who we all were. But the good times were real too. For what it is worth I still remember each of my classmates before the Lord in prayer. In that same journal, just a couple of weeks later (March 3, 1950), Thomas Merton observed that the Christian life "is a continual discovery of Christ in new and unexpected places." I suppose I went to the novitiate expecting to discover Christ there, and I did, but I new and unexpected ways - and through people I had not known before, some of whom I still didn't yet know how to appreciate. I guess it's all part of the amazing mystery of grace! And what is vocation but a special experience of grace? This afternoon I saw the new film The Butler, loosely based on the life of Eugene Allen, for 34 years a White House Butler during the administrations of Eisenhower, Kennedy, Johnson, Nixon, Ford, Carter and Reagan. Five of those presidents - Eisenhower, Kennedy, Johnson, Nixon, and Reagan - are actually portrayed. But the movie isn't really about them or about the White House or even about being a butler in the White House. It's primarily about the radical transformation of race relations in the U.S. during those years - as witnessed and experienced by the butler Cecil Gaines (played superbly by Forest Whitaker), his wife Gloria (Oprah Winfrey), and his sons, friends, and co-workers. Starting from Cecil's painful childhood in violent, racist Georgia, the film traces his development of the skills called for in a domestic servant, which led him to a hotel in Washington, DC, and from there to work at the White House. Once he's there, the White House becomes background for the complex family drama involving Cecil, his wife, and his increasingly militant elder son, Louis. Both the real-life presidential politics Cecil observes close-up in the White House and his own family conflicts are all completely caught up in the political and social turbulence of the Civil Rights movement and its aftermath. It was quite a powerful experience to watch the reenactment (and occasion real footage) from that period that was so significant for my generation. There was a certain special poignancy to watching it here in Tennessee! The family story is well developed and engaging. The White House story increasingly seems just background, although the personal interactions of the butler with the Presidents and two First Ladies are tantalizing. One might have wished for more such scenes, more insight into the complexity of that unique (because the Presidency is so unique) inter-racial, Upstairs-Downstairs story. The principal personal interactions mostly occur in tandem with the great moments in the Civil Rights struggle - starting with Eisenhower's sending Federal troops to integrate Little Rock's schools. Of course, we also get the Kennedy assassination - although almost in passing. Likewise, young Louis's personal, political journey through the Civil Rights and Black Power movements is rushed and insufficiently developed. What makes the movie work, of course, is the excellent cast, whose superb characterizations more than make up for the story's untidy loose ends. Ultimately it is a movie about an era and about the people who made that era and the people and society that were irrevocably transformed by it. At present, two European states - the UK and Denmark - have reigning queens . The Netherlands has a just recently retired one. Along with the Netherlands, Norway, Sweden, and Spain each have a king, each of whom is married and whose wife is, therefore, a queen. Belgium also has a queen dowager and a queen mother. So that's nine queens of one sort or other in contemporary Europe. But today the Church honors the longest-reigning Queen of all. Today's feast of the Queenship of the Blessed Virgin Mary is a very modern addition to the calendar, having been created by Pope Pius XII only as recently as 1954. But the concept of Mary's queenship and devotion to her as queen are quite ancient and deeply rooted in both the Eastern and Western Churches. In the West, the Coronation of Mary is the final event in that familiar series of special events in salvation history one meditates on when praying the rosary. Traditionally there have been 15 such "mysteries of the rosary" - 5 joyful, 5 sorrowful, and 5 glorious - as formalized in 1569 by the Dominican Pope Saint Pius V in the Bull Consueverunt Romani Pontifices. Meditating on this final "mystery" of Mary's coronation as queen, Blessed Pope John XXIII wrote in 1961: "The meaning of the whole rosary is summed up in this scene of joy and glory, with which it ends." That sense of "joy and glory" is beautifully conveyed in a painting by 19th-century American artist William Laurel Harris above May's altar at the Paulist Mother Church in New York. It portrays Christ the King crowning his Mother, flanked by God the Father and the Holy Spirit. Watching are a host of angels and saints. If we think in temporal terms, If we imagine Mary's "coronation" as a temporal event following upon her assumption, then obviously most of those saints would not have been there to see it. But that is evidently not how we are to imagine Mary's "coronation." Even in the case of an earthly monarch, after all, a "coronation" is more than just some one-time event but is intended rather to establish and symbolize an ongoing relationship between the monarch and his or her people. 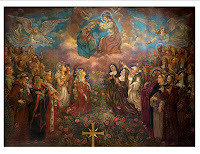 That is what the imagery of Mary's "coronation" is meant to signify for us, who are intended to include ourselves among the throng of angels and saints in that picture experiencing Mary's queenly power here and now and thus anticipating the "joy and glory" we hope eventually to be fully a part of. Mary's queenly status is derivative from her role as Mother of God, the principal title to which all her other titles are related. Most of us probably addressed her as Mother and Virgin before ever addressing her as Queen. For most of human history, motherhood and virginity were powerful statuses and were socially valued as such. Sadly, however, that may be less so today. Queenship, on the other hand, still has powerfully evocative resonances. Perhaps the heightened modern emphasis on this Marian title may be a providential vehicle for religion today, vividly keeping before the Church the image of final fulfillment in "joy and glory." In a society in which now virtually every special interest group has its day or week of month, it makes sense that there should be a National Senior Citizens Day to recognize the contributions we senior citizens make to our communities. In fact, however, I had never heard of it before, but discovered this morning that National Senior Citizens Day is observed annually on August 21. I guess that's only fitting that I just discovered it this year, since I only officially became a senior citizen just a few months ago! Ironically, August 21 was my grandmother's birthday. The only one of my four grandparents whom I personally knew, she lived to be 90 and would have been 146 today. When I was a boy, she was the oldest person in our home, my oldest relative, and probably the oldest person I knew at all. There were lots of people older than I was, of course. But she was really "old," the most "senior" person I knew. So most of my first impressions of senior status - or, as we called it then, old age - were based on my experience of her. Her family was her life, and I took great comfort in her love for me. 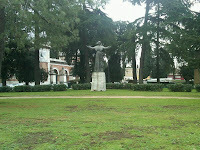 She was a living link with Italy and with the experience of immigration. She had a great love for the Church and its worship and evidently passed that love on to me. She was a great example of a life-long commitment to faith and family that was enriched rather than diminished by age and time. The euphemism "senior citizen" was, as I recall, a creation of the Kennedy years. Significantly, it entered our vocabulary just as the different generations were starting to separate into distinct publics (and consumer niches), and the common cross-generational world was irrevocably splintering. I wonder what the experience is today of senior citizens for most younger people and whether we can get beyond the separation of seniors into just another special interest group - a very large and powerful interest group with more political and economic clout than the young. Privileging the past is important. A society that marginalizes its seniors suffers an irreparable loss. But privileging the past in an exclusive way that prejudices the future is problematic for a society. The senior experience is also and inevitably an experience of coming to terms with limits - physical limits to what one can do, limits to what what can continue to expect or hope for, the imminent limit to one's lifespan and what one cherishes in life. It's natural and normal to get old and in its own way a good thing, but to appreciate it one must come to terms with and get beyond the reality and the experience of being diminished. I recently read a prayer by a now deceased Paulist, Fr. Edward H. Peters (1900-1992), who was already an ":older Father" when I joined the community. Had she been able to read and speak English, my grandmother could have prayed it! what it means to be an oldster. of what it means to be old. as happening to someone else. that I have entered a new station in life. What new obligations have I assumed? in which I find myself? to this new station in life. A few years ago, I read a wonderful biography of Prince Philip of Hesse, who died in 1980, and was head of the distinguished dynasty that had ruled part of central Germany for centuries. One of the book’s themes is the interconnectedness of Europe’s princely families and the drama of those relationships during the 1st and 2nd World Wars. Philip himself was a nephew of the German Emperor, William II. During World War I, Philip’s cousin, Britain’s King George V, was his country’s principal enemy. In World War II, Philip’s father-in-law, King Victor Emmanuel III of Italy, was an ally who famously switched sides midway through the war, with consequences catastrophic for Philip and fatal for his wife, the Princess Mafalda, who died in a German concentration camp 79 years ago this week. Jesus in today’s Gospel used the potential for family conflict to illustrate his larger point about the complete commitment demanded of every disciple. One of the fundamental facts of life is that saying “Yes” to some one particular person, cause, or commitment often entails saying “no” to other options. So it is with the decision to follow Jesus, a commitment that is meant to matter enough to change everything. In this matter, Jesus himself set the standard. After all, Jesus did not die peacefully in his bed or while on vacation at the beach. Rather his death was due directly to the way he lived and the opposition that produced. Of course, no one wants to be at odds with one’s family, friends, country, or whatever. No one should ever want conflict. But conflict happens – not always, but often enough, and especially in those great either/or choices that produce martyrs (and almost martyrs, like poor Jeremiah in today’s 1st reading). One of modern history’s more sobering facts is that the past century has produced more Christian martyrs than any other century. And then there are all the ordinary situations, which lack the high drama of martyrdom, but which can on occasion also call for doing something different from what one would otherwise have done, even at the risk of opposition. Of course, we would all prefer a calm, untroubled life, in a calm, conflict-free world. We voice that sentiment every day when we pray that we may be always free from sin and safe from all distress. It’s not conflict per se to which Jesus calls us. It is commitment which he challenges us to live – to be clear about what matters most, clear about our purpose in life, clear about what needs to be done (or not done). It is the challenge of being willing to be transformed by God’s grace into the person God wants me to be – and being thus transformed while still a part of an otherwise untransformed world. And, because we live in an otherwise untransformed world, that transforming experience can at times really resemble a sword separating us from whoever or whatever we would otherwise have so readily clung to. Jesus does indeed promise peace to his disciples – the peace of his kingdom, a very different peace from a momentary absence of conflict. As Christians, we should not and must not go around with a chip on our shoulder as if we were spoiling for a fight. After all, the fruits of the Holy Spirit include love, joy, and peace – not hatred, hostility, and anger). The challenge, rather, is to build bridges, not knock them down – to pave the way for more and more people to experience the peace and unity of God’s kingdom, yet all the while still struggling to do so in an unconverted and untransformed and hence potentially hostile world. Homily for the 20th Sunday in Ordinary Time, Holy Ghost Church, Knoxville, TN, August 18, 2013. "Born on a mountain top in Tennessee"
I probably had only the foggiest idea then where Tennessee actually was, let alone imagined I might someday be living there! The real Davy Crockett was born in Green County, Tennessee, on August 17, 1786. (That was the same year that what is now Knoxville was settled. In five years, Knoxville became the territorial capital. In another four, Tennessee became the 16th state). Crockett himself served in the Tennessee Militia in the War of 1812, fought against the Indians (who were allied with the British), then served in Congress in Washington, DC, finally famously ending his career at the Battle of the Alamo in San Antonio in what is now the state of Texas. Crockett's body and those of the other Alamo defenders were all burned by the Mexican military. It is believed that their ashes were later interred in the local church, now San Antonio's San Fernando Cathedral. A century later, their supposed remains were reburied in a marble sarcophagus now on display in the cathedral. I don't ascribe a lot of significance to my boyish fascination with Davy Crockett. He was, after all, the kind of character boys were supposed to identify with (at least as he was portrayed on screen). Those were also the days when Westerns were a regular entertainment staple - both at the movies and on TV. Of course, in contrast to all those movies, mine was a totally urban life - a totally citified experience that had little in common with the "frontier," either as it really was or as it was romanticized on the screen. The frontier had centuries before migrated away from the east coast, and by Crockett's time it was already moving rapidly westward. Rural life persisted, of course, sometimes surprisingly close to urban centers. But the "frontier' had long since disappeared physically - even as it continued to loom large in American self-understanding. The "frontier" myth of the self-starting individual still survives. Indeed, it is at the core of so much of what ails America today. Yet such is our fixation on freedom that we as a society seem to have retained only one part of the lesson of the "frontier" - the individualistic, destabilizing part - to our long-term loss. As for Davy Crockett, he certainly did well for himself, but he didn't do it alone or spend most of his time on his own. He had a family and was sufficiently rooted in his community to be elected to Congress. Even his death was communitarian in character. He was taking part in a collective rebellion intended to create a new Anglo community (in a state which until then already had a well established, Spanish-speaking, Catholic government). A couple of years ago, when I was trying to get my Italian up to speed in preparation for the course I was being sent to take in Rome, I discovered a veritable treasury of old Italian newsreels on YouTube – everything from King Victor Emmanuel III opening the Italian parliament in the 1930s to Pope Pius XII’s visit to the famous Dominican church of Santa Maria Sopra Minerva in April 1940 as part of his (unsuccessful) strategy to keep Italy neutral in World War II. Among the many videos I watched were several from the 1950 Holy Year – including the events surrounding Pope Pius XII’s solemn definition of the dogma of the Assumption of the Blessed Virgin Mary on November 1, 1950. One video shows how on the previous evening, for the first time in almost a century, the famous image of Maria Salus Populi Romani (Mary, Safety of the Roman People) was carried in solemn procession from downtown Rome to St. Peter’s, where it remained overnight at the papal altar over St. Peter’s Tomb. 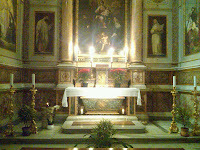 (That famous image is ordinarily in the Papal Basilica of Saint Mary Major. 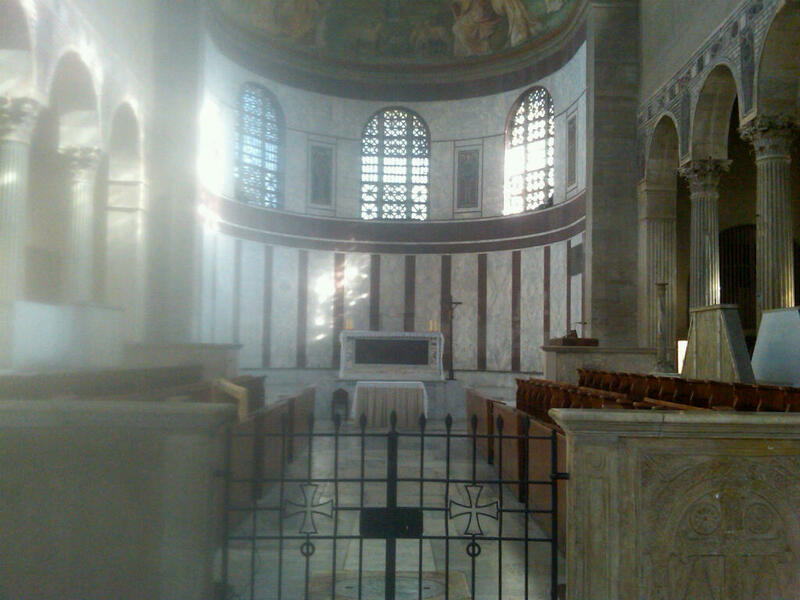 It was there that Isaac Hecker prayed before it after his expulsion from the Redemptorists in August 1857, and it was there that Pope Francis went to venerate that same image on the day after his election as pope last March). The old newsreels also show Pope Pius XII being carried on the sedia gestatoria through the piazza on the morning of November 1, 1950, where, after the solemn petition by Cardinal Tisserant on behalf of the whole Church and after the invocation of the Holy Spirit through the singing of the hym Veni Creator Spiritus, the Pope himself read the words of the dogmatic definition: “after we have poured forth prayers of supplication again and again to God, and have invoked the light of the Spirit of Truth, for the glory of Almighty God who has lavished his special affection upon the Virgin Mary, for the honor of her Son, the immortal King of the Ages and the Victor over sin and death, for the increase of the glory of that same august Mother, and for the joy and exultation of the entire Church; by the authority of our Lord Jesus Christ, of the Blessed Apostles Peter and Paul, and by our own authority, we pronounce, declare, and define it to be a divinely revealed dogma: that the Immaculate Mother of God, the ever Virgin Mary, having completed the course of her earthly life, was assumed body and soul into heavenly glory (Apostolic Constitution, Munificentissmus Deus, 44). 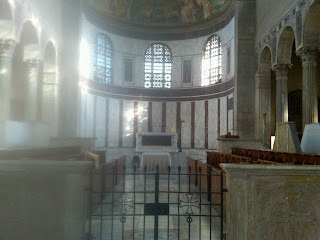 Among the bishops in the piazza that day was the future Pope John XXIII. Years later, he wrote: “As Nuncio to France, I was one of the fortunate ones present at that ceremony in St. Peter’s Square. I felt no anxiety about this doctrine, having always believed it “(Journal of a Soul, August 15, 1961). “This is a source of consolation and faith, in days of grief or pain, for those privileged souls – such as we can all become, if only we respond to grace – whom God is silently preparing for the most beautiful victory of all, the attainment of holiness. Merton's surreal experience may seem somewhat over the top. I can remember spending many a summer evening outside and hearing the radios and TVs from all the neighborhood's open windows, but my imagination never quite took me as far as Merton's did. But recalling Merton's strong experience powerfully reminded me of that time - just decades ago - when there were a lot of things we all heard (and listened to) together. It wasn't that long ago, for example, that many of us regularly watched the evening news. In the pre-cable world, there was a limited number of channels. Most households had only one TV; so everyone - adults and children, old and young - all watched the same shows and so shared in a common cross-generational culture that can no longer exist in this age of niche programming. But back to the news! From the early 60s certainly through the 80s, the three networks' half-hour evening news programs were commonly and widely watched. (Thus, at Princeton's Graduate College in the 1970s and again in seminary in the 1980s, students regularly watched the news together. I'm sure my experience of, for example, the Watergate saga, would have been very different indeed had I experienced it all alone). Whatever stylistic and personality differences distinguished the three networks, the basic coverage was usually more or less the same. It reflected - and helped perpetuate - a common understanding of the facts about the larger world, about what mattered, and why. It gave people common references they could talk about and discuss and debate. As such it was, I suppose, somewhat limited - as we are constantly being reminded by those who praise contemporary media culture for having radically opened up the process and democratized it. That may well be true. In fact, I am sure it is. But at what price? Just as today parents and teens don't watch the same programs anymore and more broadly share less and less of a common culture, i.e., a common experience and understanding of the world and a shared basis for communication, so it is with the news, as each cable channel and internet media outlet caters to its particular niche market. These niche markets are increasingly ideologically identified audiences of like-minded people, who choose to hear the news they agree with and are less and less exposed not just to opinions but even to any facts that don't support their beliefs. For Merton that June evening, that one common sound seemed like the most solid thing in the city. Likewise, the shared cultural experience of common acts and a common frame of reference for forming opinions and being able to discuss and debate was something solid - something sadly long-since lost and almost unimaginable today. It was Sunday, August 13, 1961, a typical summer Sunday spent picnicking at the Bronx's Orchard Beach with my multitude of aunts, uncles, and cousins. I was 13 and about to start high school in a month. The news came over the portable transistor radio (required for listening to the obligatory baseball games). The East Germans had closed the border between East and West Berlin. The full impact - and horror - of this would become clearer in the coming days as a permanent wall was erected to demarcate the boundary, becoming for the next 28 years one of the most recognizable symbols of the Cold War. Coverage of national and international news was much more sober in those days. Still, the wall was treated as a provocation and the beginning of yet another crisis. In fact, as we all know now, it actually defused the crisis. By imprisoning the East German population behind it, the wall solved the East German Communists' problem - and by extension that of their masters in Moscow. It also solved the West's problem of constantly being worried about the defense of West Berlin. It took time for that to sink in. Thus, a year later at the time of the Cuban Missile Crisis, Kennedy and his advisers worried whether this might be a distraction from a serious Soviet move on Berlin. But in fact the wall's permanence became the symbolic guarantor of the permanence of the division of Europe and the consequent Cold War. That Cold War would warm up occasionally with this or that crisis, but the underlying arrangement seemed to have become permanent. And its permanence seemed to guarantee that the Cold War would stay cold (even as it continued forever). So adjustments of various sorts became the order of the day - Ostpolitik, "Détente," etc. Apocalyptic expectations persisted in certain quarters. Teaching in the 1970s, I recall a colleague seriously suggesting a scenario for a Soviet move westward to take over most of Europe. Anti-nuclear advocates tried to scare audiences with visions of total destruction, "nuclear winter," etc. Some theorists argued against the morality of nuclear deterrence - thus seeking to undermine the very thing that had kept the Cold War cold all along and had made Berlin a divided city instead of a battlefield. When Andrei Amalrik wrote Will the Soviet Union Survive Until 1984? his thesis was widely rejected as not credible. He was wrong of course - but just by a few years. In the end the Wall came down as quickly as it went up, and the monstrous apparatus of the Soviet Evil Empire soon followed suit. 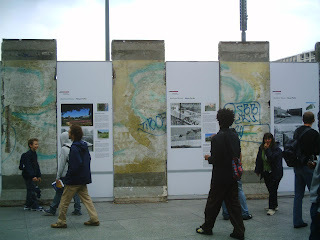 One can still see some deliberately preserved pieces of the Wall in Berlin (photo taken August 13, 2005). There are other mementos here and there of the old border, but Berlin and the world have long since moved on. No one should minimize the malevolence of Communist rule in eastern Europe or the misery it inflicted on its captive population. That said, however, the Cold War proved to be a rather peaceful and prosperous period in the west - especially in western Europe, which made a phenomenally swift recovery from its post-war state. While the Wall was surely a symbol of how bad things were on the eastern side, it was just as surely a symbol of how really good things were on the western side. Sadly, it was also assumed to be a symbol of the permanence of it all. None of us knew it at the time, but underneath the surface stability and permanence serious social and cultural change was underway. Paradoxically it was in the 1960s aftermath of the Wall that the centuries' old culture of the west began to unravel. Perhaps it was the very stability the Wall symbolized that accelerated that process. The West's cultural transformation was already well advanced by the time the Wall fell and the East rushed headlong to embrace that transformation for itself. And so here we are - better off in some ways, worse off in so many others. And that mean and ugly Wall we all professed to hate so much seems to have helped the process along, becoming in retrospect as sign of the wall of incomprehension between the familiar past and the novel present. This past Sunday's New York Times Magazine featured a very revealing article about family life today, "The Opt-Out Generation Wants Back In." The article looks back at a group of 22 women who a decade ago were "highly educated, very accomplished, well-paid professionals with high-earning spouses" who "made headlines for leaving the work force just when they were hitting their stride" in order to be full-time mothers. The stories are complicated and diverse - as all human stories are - but the basic leitmotif that runs through them all is how these accomplished, well-paid professionals, having abandoned their careers to be full-time mothers at home, have found themselves once again unsatisfied and looking for something more. The article examines the difficulty (especially given the changed economy, which presumably no one would have predicted a decade ago) of re-entering the work force at anything like the level they left. Needless to say, their story is simultaneously that of many families and few - many in that most mothers have to somehow sort out and accomodate the responsibilities of parenthood and family and the economic necessity and cultural expectation of work outside the home, few in that these particular families were in the relatively small subset of American households that could afford to make it a matter of choice. My own mother worked when I was growing up. I think she liked it, but it was also an economic necessity. Fortunately, she had my grandmother living with us to help out. Indeed, as the author acknowledes, when these well-positioned women were choosing to leave the work force, others "poor mothers who couldn't afford child care" had to do so without attracting media notice. This highlights what for me stands out so dramatically in this discussion. There is a lot in these stories that is reflects the different ways we value different activities and the complex ways in which our society values and devalues different activities and those who engage in them. But underlying it all is that old problem of how we as a society make those value judgments largely in terms of money. Generally speaking, we value higher earners more than lower earners, and earning an income of one's own has enormous power over our psyches, which makes the choice to forego doing that perennially problematic. Thus we read, for example, that trading in "business meeting, client dinners and commissions" resulted in growing dependency "and a sense of personal dislocation. Without a salary or an independent work identity, her self-confidence plummeted." How society solves the problem of adequately socializing the next generation while simultaneously meeting the economic and personal-fulfillment needs of modern parents is a big question beyond the scope of this modest post. But I suspect any such solution will always be hard to come by unless and until we can more successfully incorporate other considerations besides income - and on an at least equal par with income - in evaluating one's fundamental life choices. Quam clarificata est Jerosolyma Stephano, tam illustris fieret Roma Laurentio ("As Jerusalem is made glorious by Stephen, so Rome is made illustrious by Lawrence"). So said Saint Leo the Great preaching on today's feast of the great Roman deacon-martyr Lawrence. During my time in Rome last year, I got to visit three Roman churches named for Saint Lawrence - San Lorenzo in Lucina, San Lorenzo in Panisperna (honoring the site of Lawrence's martyrdom), and the great Basilica of Saint Lawrence Outside the Walls, where Lawrence is buried. 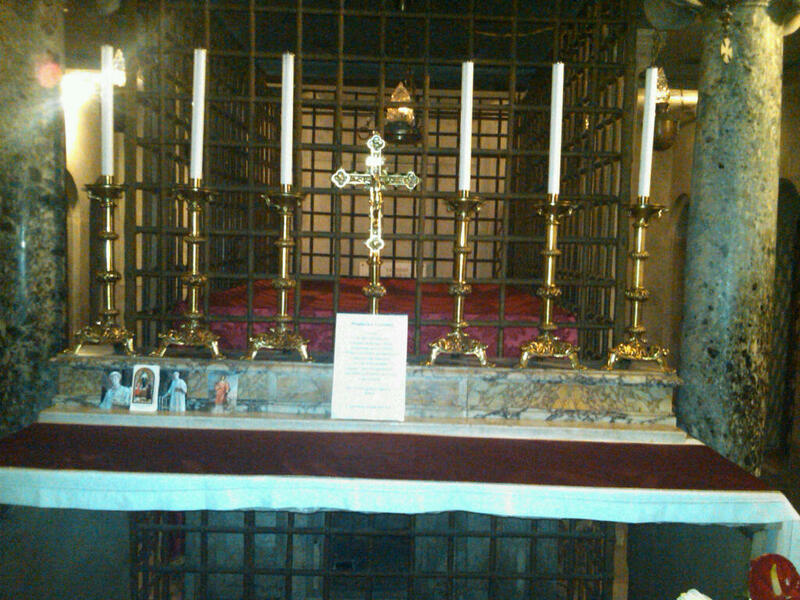 (Photo is of the altar at the site of his burial). Christian Rome produced many martyrs - among them Pope Sixtus II and four other Roman deacons who were martyred just four days before Lawrence in 258 during the persecution of Emperor Valerian. What made Lawrence stand out so? As deacon, Lawrence was apparently in charge of the material possessions of the Roman Church and of its alms for the poor. According to tradition, after the execution of Pope Sixtus the Prefect demanded that Lawrence turn over the Church's treasure. Supposedly, Lawrence quickly distributed as much of the Church's property as possible to the poor and then went to the Prefect and presented to him the poor. "Behold in these poor," Lawrence said to the Prefect, "the treasures I promised to show you." 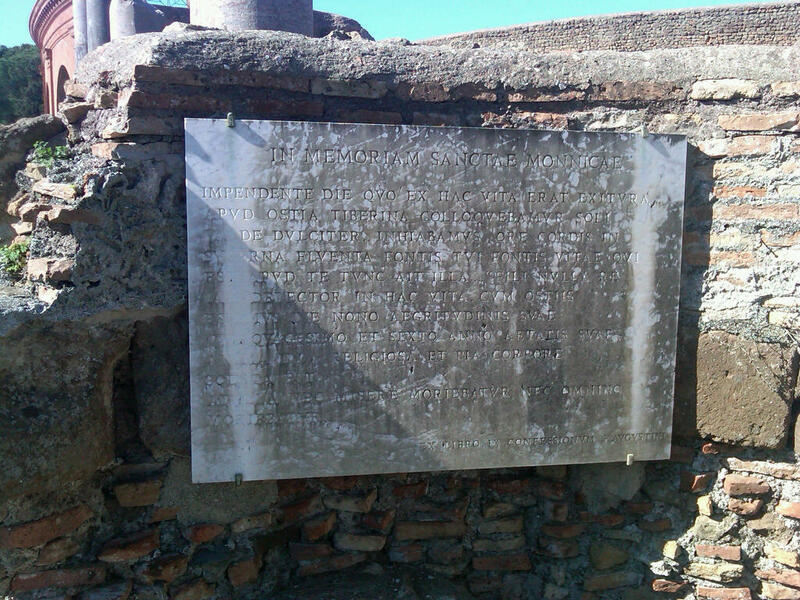 The site of Saint Lawrence's burial, the Basilica of Saint Lawrence Outside the Walls (one of the traditional seven "Pilgrimage Churches" of Rome), is located in the traditionally working-class neighborhood that suffered a direct hit during the American bombing of Rome in July 1943. That event famously brought Pius XII rushing there, with money for local victims. (That event is memorialized there in this monument to Pope Pius as "Defender of the City"). In the late 20th century, it became quite common, especially among professed Religious, to talk about a "preferential option for the poor." Lawrence lived it. Hence his standout status in 3rd-century Rome - and a good reason why we remember (and hopefully imitate) him even today. 150 years ago, one of Isaac Hecker’s original companions in the Paulist community’s founding, Paulist Father Francis Baker (1820-1865) preached a sermon at the Paulist Mother Church, entitled “The Preacher, The Organ of the Holy Ghost.” The occasion was the 4th Sunday after Easter in the historic Roman Calendar, for which the traditional Gospel reading would have been John 16:5-14. One of the images Father Baker used, which I suspect must have been a consolation to preachers then just as it is to preachers now, was “the Divine Sower scattering the seeds of truth and virtue.” It is an image that I think every preacher ought to keep constantly in mind – not just because it explains why not everyone will respond positively, but because it highlights God’s extreme generosity and patience, which ultimately account for whatever fruit preaching produces. Living in this much more prosaic age, I confess I have never imagined my preaching in this way. And, frankly, I think it somewhat challenging to do so, for all sorts of reasons which reflect today’s changed sensibilities. That said, however, it is a challenge to take somewhat more seriously the unique encounter with the Lord which we believe occurs at the altar and to allow oneself to be as awestruck by it as the prophets were. Today (August 8) the Church's calendar commemorates Saint Dominic (c.1170-1221), the Spanish canon who adopted an apostolic evangelical way of life to combat the heresies of his time and founded the Order of Preachers (the Dominicans). Like many of my contemporaries, I was taught by Dominican Sisters in elementary school (specifically grades 2, 5, 6, 7, and 8). Based on the initials "O.P." after their names, students sometimes jokingly referred to the Sisters as "Our Problem." To elementary school students, perhaps all teachers sometimes seem so, but in fact the Sisters they were for the most part good teachers and dedicated religious. What at that time most fascinated me about the Dominicans, however, was that they were the only religious order that I had any personal experience of which had its own liturgical rite. Every year or so, a Dominican priest would come to preach a novena or it would be the turn for a Dominican mission band to preach the annual parish mission. As an altar boy, I would get the rare experience of watching up close as Mass was celebrated in a different rite - not radically different, of course, but different enough to require us altar boys to learn some different moves. As my interest in all things liturgical matured, I continued to be interested in how the Dominican Rite came to be and where it fit into the larger story of the development of Latin liturgy. Having begun as canons, the Dominicans naturally took their liturgy very seriously, but the animating principle of the order has always been preaching and the study required to preach effectively. In his "Treatise on the Formation of Preachers," Dominican Master General Humber of Romans (1200-1277) wrote: "Of all the spiritual exercises commonly practiced by spiritual men, those who have the grace for it ought to prefer the practice of preaching." Living practically next door to the Dominican House of Studies in Washington, DC, during my seminary years, I was duly impressed by the Dominicans' intellectual commitment and how it continues today to enrich the Church's life. This too was part of Dominic's original evangelizing impulse, which combined a commitment to proclaiming authentic Catholic doctrine in a communicable way with an apostolic life of evangelical simplicity. As a seminarian I was surprised to learn that the Dominicans were the first Religious to separate obedience to the Religious Rule from obligation under pain of sin. Both in the evangelizing impulse which animated their founding and in the spiritual freedom at the heart of their common life, I came to see something similar to what motivated Servant of God Isaac Hecker in how he shaped his Paulist community in the different (but not incomparably unique) setting and circumstances of mid-19th-century American society. Among his confreres, Hecker himself was not a particularly outstanding preacher, which ought to be of some consolation to those among us who are less entertaining but who nonetheless share his - and Dominic's - vocation to live out the grace of preaching in the totality of life and ministry. (The photo above is of the Basilica of Santa Sabina on the Aventine Hill in Rome, famous for being the Stational Church for Ash Wednesday but also as the Dominican convent where Saint Dominic himself lived, as later did such Domincan luminaries as Saint Thomas Aquinas and the future Pope Saint Pius V). The U.S. is admittedly nowhere near being a childless society - at least not yet. This isn't yet Italy where nearly one-quarter of women are childless. Still the U.S. birthrate is now the lowest in its history and likely to get lower - the fertility rate having dropped a full 9% between 2007 and 2011. These numbers are from an article in the August 12 issue of Time, tellingly entitled "None Is Enough," by Lauren Sandler. Sandler cites the standard critiques of this troubling trend. She references Jonathan V. last's book What to Expect When No One's Expecting, which warns of the potential economic calamity of having fewer consumers and taxpayers. She cites Ross Douthat's argument that the "retreat from child rearing is, at some level, a symptom of late-modern exhaustion" revealing "a spirit that privileges the present over the future." Sandler's sympathies are suggested, however, by her referring to such comments as childless women "being scolded." One gets the sense from the article that the problem lies more in a culture which still prizes motherhood. Anecdote after anecdote tells the liberating tale of women who have transcended such cultural norms to embrace being not child-less (which implies a lack) but child-free. That this freedom is indeed very much all about "a spirit that privileges the present over the future" is evident from such testimonies as the following. "I get to do all sorts of thing: buy an unnecessary object, plan trips with our aging parents, sleep in, spend a day without speaking to a single person, send care packages to nieces and nephews, enroll in language classes, go out for drinks with a friend on the spur of the moment ... free from all the contingencies that come with children." Of course, these are all nice things to do. None of them are bad. Some (attending to aging parents, sending packages to nieces and nephews)are genuinely other-regarding. Most. however, are quite self-regarding. While perfectly legitimate activities in themselves, as personal priorities they seem amazingly self-absorbed and in many case incredibly trivial compared with the larger life-project of raising a family. Now, of course, not everyone is meant to be a parent. Historically, many religions have recognized this, providing a fulfilling alternative vocation. Thirty-one years ago today, I made my First Profession as a member of a Roman Catholic religious society, committed to a celibate life in community in service to the Church. Certainly many priests and religious feel the lack of family quite deeply. (One seminarian in my time even referred to not having children as "the pain of loss," which accompanies a religious vocation - clearly a sense of being child-less rather than child-free.). On the other hand, there can be no doubt that for many - historically for many women especially - religious life offered a welcome (and interesting and fulfilling) alternative to the burdens of marriage and family life and the physical dangers of childbirth. Even so, such vocations (however plentiful in previous periods) were never seen as the norm. Fatherhood and motherhood remained the normal vocations for most people. And the religious vocation was perceived by the larger community as making its own valued contribution to society. (The decline in such vocations in the Western world today is surely due in at least some measure to a diminished sense that such vocations really do contribute something to society). Above and beyond the economic consequences of a possible demographic desert, what happens when a society privileges its present over its future to such an extent that the pursuit of personal self-actualization acquires en ethical value equal to the vocation of parenthood? The modern world is embarked on an historically and morally novel path - the first society ever to attempt to organize itself on an individualistic basis, free from the encumbrances of religion and family. It remains yet to be seen whether such a project can seriously succeed over any long term and what such a brave new world might look like. On this date in 1942, Queen Wilhelmina of the Netherlands addressed the U.S. Congress – the first Queen ever to do so. The Dutch monarch was one of several heroic figures of that era who had refused to accept the apparent inevitablity of German victory in World War II – people like King Haakon of Norway, General Charles De Gaulle of France, and of course Prime Minister Winston Churchill of Britain. I am constantly reminded of those heroic figures from another (and, for later generations, increasingly incomprehensible) age, every time I hear that frequently employed but nonetheless absurd expression about being “on the right side of history.” In 1940, when Wilhelmina, Haakon, and De Gaulle fled to establish exile governments in London where the British government and people opted to follow Churchill rather than those tainted by appeasement, the direction of history was obvious. It was imminent and total German victory. Still they resisted in the belief – or at least hope – that history’s direction could be changed. In the end, of course, they won. So someone could say that they ended up “on the right side of history,” but that just shows that “the right side of history” can change – and change quickly. (It also suggests that, with effort and good luck, human beings can change the direction of history, that “the right side of history” really is not pre-determined, which also makes it ultimately uncertain). The notion that secular history has some purpose – presumably leading to progress – was particularly popular in the 19th century, right up until World War I seemed to prove the contrary to many disillusioned disciples of modernity. The idea of history’s inevitable direction was, however, a key component of the 19th century’s most notoriously lasting delusion, Marxism. “Communism,” the young Marx wrote in 1844, “is the riddle of history solved, and it knows itself to be this solution.” As a meaningful movement, communism is gone; but the lasting effects of Marx’s theory of history linger when supposedly secular people persist in invoking history’s directedness. It is, of course, commonly claimed that Marx’s theory of history represents a secularized distortion of Christian apocalyptic. It is, indeed, true that both Christianity and Marxism share a linear view of history, culminating in a desired end. There is, however, little in the Christian conception of history that suggests that specific secular trends possess inherent salvific significance. On the contrary, much of what passes for human history suggests alienation and estrangement from the final fulfillment promised to the faithful at history’s end. Even Marx, when he wrote more journalistically, commenting on contemporary events in their context, sometimes toned down his determinism - as, for example, in his 1852 interpretation of the rise of Napoleon III, The Eighteenth Brumaire of Louis Napoleon. In the various great and trivial conflicts which contemporaries feel compelled to choose up sides about, the motives underlying any individual position may be noble or ignoble, wise or foolish, moral or immoral, but they cannot claim to be based on the inherent meaning of history, much less on any certainty of its direction beyond the temporary and transient. A few years ago, as I was trying to get my Italian up to speed for my course at the Congregation of the Causes of Saints in Rome, I discovered a veritable treasury of old Italian newsreels on YouTube – everything from King Victor Emmanuel III opening the Italian Parliament in the 1930s to Pope Pius XII’s visit to the famous Dominican church of Santa Maria Sopra Minerva in April 1940 as part of his (unsuccessful) strategy to keep Italy neutral in World War II. Among the many videos I found were several from the 1950 Holy Year – including the events surrounding Pope Pius XII’s solemn definition of the dogma of the Assumption of the Blessed Virgin Mary on November 1, 1950. One video shows how on the previous evening, for the first time in almost a century, the famous image of Maria Salus Populi Romani ("Mary, Safety of the Roman People") was carried in solemn procession from downtown Rome to St. Peter’s, where it remained overnight at the papal altar over St. Peter’s Tomb. That famous image is ordinarily housed in the Borghese Chapel in the Papal Basilica of Saint Mary Major. It was there that the future founder of the Paulists, Isaac Hecker, went to pray before that image after his expulsion from the Redemptorists in August 1857, and it was there that Pope Francis went to venerate that same image on the day after his election as pope last March. Today the Church commemorates the Dedication of that Basilica by Pope Sixtus III (432-440). 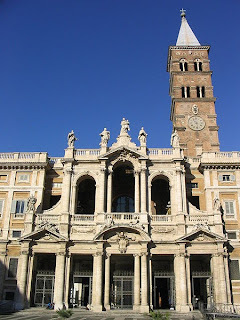 Built to commemorate the Council of Ephesus (431) which affirmed the Blessed Virgin Mary’s title as “Mother of God,” the Basilica of St. Mary Major is one of Rome's four principal papal basilicas (along with Saint John Lateran, Saint Peter’s, and Saint Paul’s Outside the Walls). The smallest of the four, Saint Mary Major is a classical basilica with a wide nave, two side aisles, and a semicircular apse at one end of the nave (the basic model Isaac Hecker was attracted to in planning his design for the Paulist Mother Church in New York). Its 14th-century bell tower is Rome’s highest. Its 16th-century ceiling is gilded with gold, supposedly brought back from Spain’s newly conquered American empire. 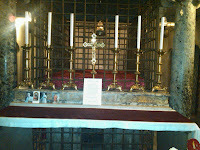 Under the papal altar is a crystal reliquary which supposedly contains wood from the original crib of Jesus in Bethlehem. Back in the glory days of the Roman “stational churches,” this was the site of the Pope’s Christmas Eve Midnight Stational Mass (as well as many other major occasions during in the Church's calendar). The future founder of the Jesuits, Saint Ignatius Loyola celebrated his first Mass in that crypt on Christmas Day in 1538. After more than a century and a half, the "Church on Summit Hill" still stands, smaller than Saint Mary Major to be sure, but a comparably eloquent witness to Mary's motherly patronage of God's People.